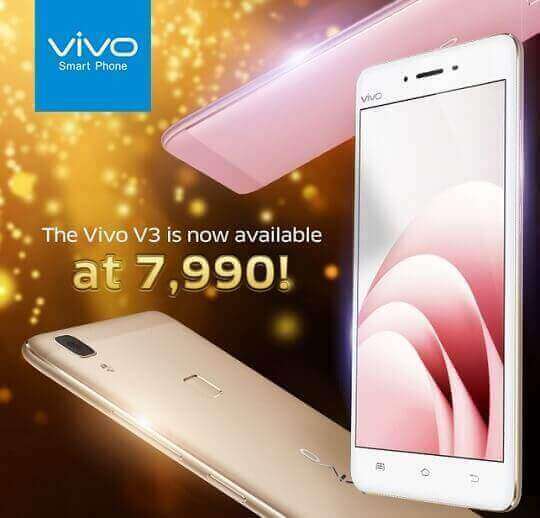 Vivo Philippines recently announced a huge price cut on their previous smartphone model, the Vivo V3 to be exact, wherein consumers can now buy it for a much more affordable asking price of Php7,990 or 4000 pesos discount from the original SRP of Php11,990. Previous phone models do not equate to lesser performance when compared to newer devices, some are equally, if not better, than other units with the same price tag. Just like the Vivo V3, it was already a very competitive handset even before the price mark down, and with the massive discount, the price-to-specs ratio goes up a few notches higher. To give a quick recap, it offers 5-inch HD IPS display powered by 64-bit Qualcomm Snapdragon 616 octa core processor clocked at 1.7GHz paired with 3GB of RAM and 32GB of expandable storage. It is also equipped with 13MP f/2.2 main shooter and an 8MP f/2.2 secondary snapper. The other notable specs are dual SIM with LTE connectivity, AK4375 HiFi audio chip, fingerprint sensor, and 2550mAh battery. Except from the display department, it simply overpowered their very own Vivo Y55 that carries the same price tag. Of course, the stocks are limited, and for sure the phone maker want to ensure that old stocks will be out of their inventory, just like what they did with the V3 Max.